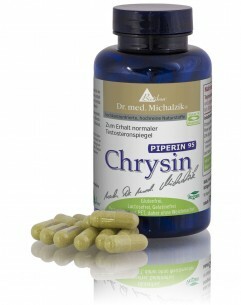 Chrysin Piperine by Dr. med. Michalzik the powerful flavonoid chrysin (5.7 Dihydroxyflavone) is found naturally in the plant Passiflora caerulea). This particular formula contains zinc and the important Piperine. Chrysin Piperine by Dr. Michalzik is subject to strict examinations of German supervisory authorities. It is manufactured by use of gentle production technologies without heat or additives and without the use of processing agents which are not required to be mentioned on the packaging. Adults, take 2 capsules with copious amounts of fluid in the morning and if necessary in addition 1 capsule in the evening. 90 capsules, each capsule containing 500 mg of chrysin and 5 mg of piperine extract.